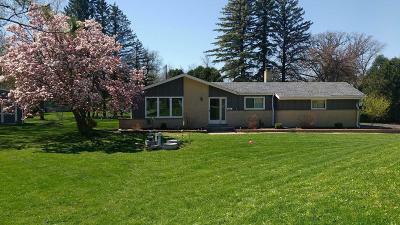 Updated brick & aluminum Pewaukee ranch features open concept floor plan. Some updates & upgrades include the following: HWF's everywhere except the LR which is carpeted; 6 panel oak doors; NFP (new warrented chimney liner) in FR w/glass doors to patio & just over 1/2 acre yard ; newer windows; Radon Mitigation System; newer Mound System(4 yrs); new roof in 2017; garage door; and tankless water heater. Open updated KT with granite counters, glass tile back splash, center island, & SS appliances. Dual entry updated full BA off MBR or hallway. Water softener included. Central Air. Attached 2 car GA w/EDO & remotes. See it before it's too late.